Elevating music: A session at the 2018 edition of World Sacred Spirit Festival. When American writer Pat Conroy said “Without music, life is a journey through a desert”, he certainly did not consider that a desert might one day become the very place where people go to find music. The Burning Man festival at Black Rock City in the US is one such example. The current edition of the WSSF will take place from February 22 to 24. Closer home, the Mehrangarh Museum Trust of Rajasthan has been the harbinger of some unique music festivals, creating properties like the Rajasthan International Folk Festival (RIFF), the Jodhpur Flamenco and Gypsy Festival (JFGF), and the World Sacred Spirit Festival (WSSF). These festivals have made meeting grounds for some of the most evocative musical traditions from across the world. 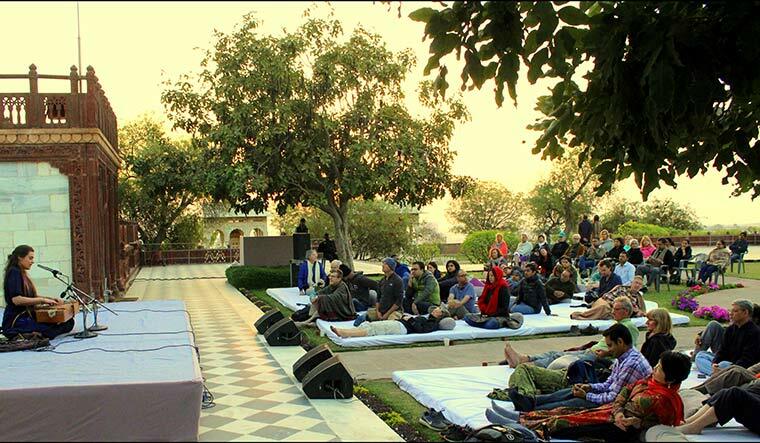 The WSSF started as a Sufi music festival in 2007, and the first edition was held at the Nagaur Fort. It was envisioned by Gaj Singh II, the erstwhile maharaja of Marwar-Jodhpur, and renowned musician, Sting—who sang the 1999 hit, Desert Rose. The town of Nagaur was a significant location for the festival, as it is the second-most important centre for the Chishti Sufi order. The festival has since grown to accommodate world spiritual music. The location of the festival, too, has changed—having moved to the Mehrangarh Fort in Jodhpur. The current edition of the festival will take place from February 22 to 24, and will host artistes from India, Iran, Turkey, Mongolia, Azerbaijan and China. Indeed, the deserts have held a special place in the history of seeking and enlightenment. Their stark and physically distressing environments often cause powerful psychological states that are comparable to accounts of mystical experiences. Mysticism itself is an all-encompassing term that includes different religious beliefs and practices. Among mystical traditions, music and dance have a special place. Mystics are usually above the politics of religion, and practice a benign, syncretic and heterodox form of faith. These have been practised by the most primitive of societies, as in the various forms of Shamanism. However, true eclecticism in these different spiritual orders occurred only when ideas started travelling to faraway lands via the Silk Route. Named after the silk trade initiated by the Han Dynasty of China in the first century BCE, it refers to the cultural, terrestrial and later, maritime routes connecting the East and the West. As political expansion and trade increased, so did the quantum of ideas exchanged. Traders and missionaries took with them their respective religions and set up temples and shrines in distant lands. Often, they would stop at monasteries and state-sponsored caravanserais, and bantered with fellow travellers. Conversations would have been about dates, saffron, silk, sandalwood, and gemstones as much as about Christianity, Buddhism, Islam, Zoroastrianism and Buddhism. Through the centuries, these religions travelled, morphed and flowered in different ways. In new nations, they gave rise to unique religious and cultural practices. The music of these traditions, too, developed in remarkable ways. Itinerant singers took the words of prophets and gods to the masses. These groups can be evidenced even today. Think of the Vasudevs roaming the roads of Maharashtra, or the Bauls of rural Bengal. The poetry of Kabir and Amir Khusrow, the snake (bite) healing dance of Nayiks, music from the Kurdish Sufi Qadiri tradition, the compositions of Mirabai, alongside qawwalis and ragas, will form the spiritual smorgasbord that is WSSF, with artistes not just presenting their talent but also their cultural and spiritual histories. For example, Telli Turnalar, a four-woman band from Anatolia (Asian portion of Turkey), will present music that is related to the Alevi tradition, an Islamic sect which follows Ali, the brother-in-law of Prophet Muhammad. There tradition is rooted in Sufism, but borrows from Christianity and Shamanism, too. In such performances of ancient traditions, in the passing down of received wisdom, in the setting of glorious pasts, music will do what it does best—elevate the human spirit.